Live streaming isn't new, but the Collab Lab has recently been exploring innovative ways to use this technology to expand professional learning connections across schools. 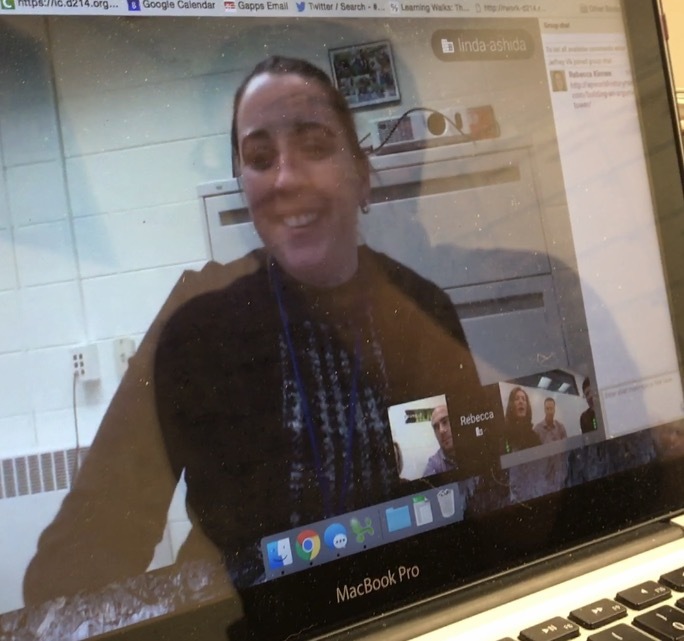 In our first virtual professional learning adventure, we used Periscope and Google Hangout to connect with teachers at Riverside Brookfield High School to live stream from two classes at EG and then debrief with the teachers at both schools. Even with a few tech glitches, that experience proved to be so valuable, energizing--and FUN!--that we couldn't stop thinking about the possibilities to use the same technologies to expand professional learning connections across our own District 214 schools. 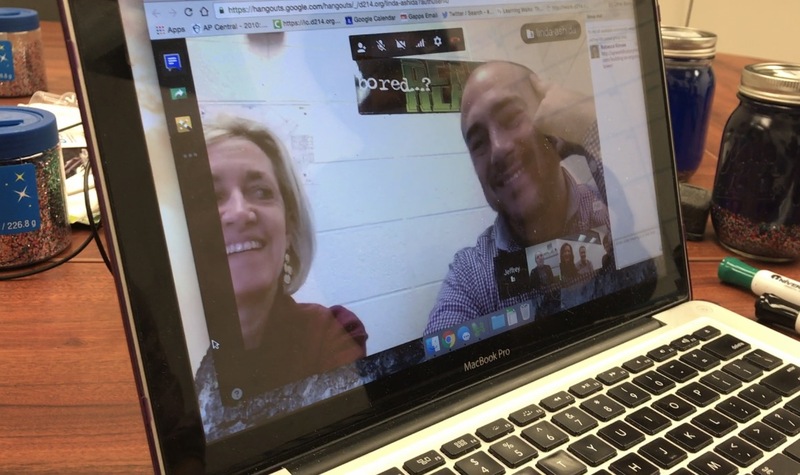 That led to Round 2: Our first D214 Virtual Professional Learning adventure. Seven teachers from three D214 schools connected with us at EGHS via Persicope to visit Mark Heintz' AP World History class. Our colleagues connected to our Periscope broadcast, and, just like with Facebook Live, they were able to interact with each other, and me while I live streamed, to make comments and ask questions. Mark's lesson offered examples to our virtual visitors of the varied ways he engages students in interpreting primary source documents to find evidence to support a claim, in order to later synthesize information from those complex texts. After working through the first document as a class, with Mark modeling how to interpret and note key evidence, the students worked in pairs to interpret a second document and respond to the prompt on the whiteboard tables. As students collaborated with their peers, Mark circulated to offer support and feedback, and pause, when necessary to give clarification to the whole class. After students responded to the prompt, with evidence from document 2, they rotated tables to read another group's response and offer feedback to their peers. Students then returned to their tables to reflect on the peer feedback and make revisions. They wrapped up the class by taking photos of their work to continue with new documents and synthesis writing the next day. Mark's lesson included models of work, student-centered engagement in learning, ongoing feedback, peer assessment, self-assessment and revision. None of the work was graded. It was all part of the formative learning process to build students' reading and interpretation skills and lead to improved quality in their final summative writing assessment. Following the live stream form Mark's classroom, we connected via Google Hangout with the visiting teachers from the other D214 schools to debrief the lesson, share feedback, and make connections in student learning across disciplines. Once again we were energized by this kind of collaboration connecting us with colleagues across schools. Not only did we share teaching strategies and learn from one another, but we also discussed possibilities for future collaboration across all of our schools. In fact, we've already planned our next live stream from Kim Miklusak's AP English Language class, in which students will be engaging in a writer's workshop. Look for a new post on that soon! And, based on feedback from the group that visited Mark's class, we have already modified the process. Participants suggested that more teachers would be inclined--and better able--to participate if the the class visit and debrief conversation were shortened and occurred during the same class period. Guided by this advice, we will live stream from Kim's 1st and 2nd hour classes for fifteen minutes and then debrief with our virtual visitors for 20 minutes in a Google Hangout. We will also look for ways to include more student voice in the process, whether it is asking questions directly to students during the class, or asking a few students to join us in the Google Hangout conversations. We'd like to thank Matt Hamilton, Teri Buczinsky, Erik Hodges, Kate Glass, Jeff Vlk, Becky Kinnee and Carrie Mattingly for joining our Collab Lab tream in this first D214 Virtual Professional Learning experience and sharing their feedback and insight for future collaborations to support our students. Do you have ideas or suggestions? Would you like to join us? Live streaming is the technological way of streaming but the technologists are focusing on more latest and innovative technology for it. So that the connection of learning among the teachers may become stronger. Get writersperhour which is really good for everyone.